Racing to pick my daughter from school yesterday, thinking about the things I have to pick up on my way home, finishing the meal I was cooking, the clinic appointments that need arranging. I found a parent setting calmly in her car sipping a cup of tea and humming to a song, I literally stopped in my tracks. Lately I have been feeling that I am constantly on the run, I seem to be ten two hours short every day. Looking at that lady with her cup made me think that I really need to do something about this. But before I do , I need to find out what my problem is..am I aiming to high?trying to do so much on my own? or is it that I need to reset my priorities and maybe put “me” on the list? ..I don’t know..just thinking out loud here..
Natalie of Cook Eat Live Vegetarian has a wonderful habit of sharing (Things that made me smile today)..she takes the time to capture wonderful pictures of simple things that bring her joy. I love reading her posts and they never fail to put a smile on my face and on my heart. Maybe I should consider something like that. A gratitude journal, or a smile journal. To set time every day or every other day to think, write down, document, savor the simple joys in life..
Are you constantly on the run?What do you do to keep it simple? 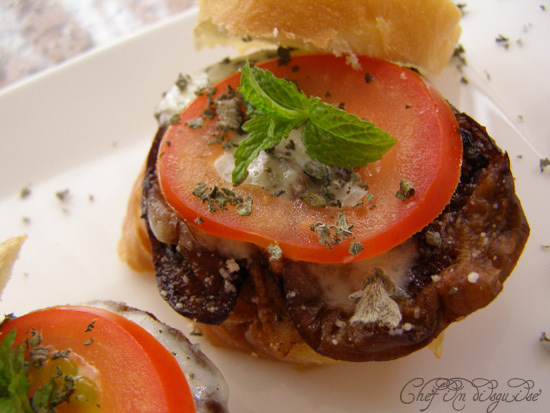 For someone with confessed sandwichmania, I have not posted that many sandwich recipes. In the spirit of correcting that comes today’s recipe. Eggplant topped with layers of flavor, add toasted bread to counter the creamy smooth texture of the eggplant and you are in for a treat. These mini sandwiches could easily lose their tops and turn into yummy crostini..to serve when you have company. Sprinkle with cheese and oregano. 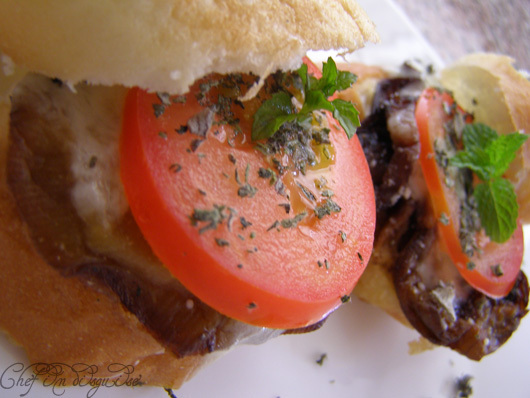 Posted in Sandwiches and tagged Appetizer, crostini, Eggplant, postaweek2011, recipe, sandwich, simple. Bookmark the permalink. I agree with you..maybe we should slow down a bit. My problem is that I’m a perfectionist..every thing has to be 100% and that is not easy..
this is the first time i saw eggplant used in sandwiches, innovative! Aaah, you told me this one was coming! 🙂 these look great! This sandwich looks amazing. I’m a big fan of eggplant, but always thought of it as too time consuming to make (eggplant parm) and so we never really eat it. But this is perfect! I love eggplant because it is so versatile..you can do so much with it.. Thank you for sharing your experience..I just might start a gratitude journal..
1) I want that sandwich. It looks delicious and I think we share a love for eggplant. 2) In teacher school, I learned about the concept of a “smile file.” Since we get trashed by students most of the day, it is really important for self-esteem to write down nice comments or put aside notes that make us feel happy. That way, I can cling to the good parts instead of the bad. I think that is why I have a “My Favorite Things” feature on my blog because I go through the week thinking about what will make the cut to be in the post over the weekend. 3) I schedule time for myself. Like, I go to my google calendar and schedule a little bit of time for myself each week, like it is an appointment. That may sound crazy, but it insures that I will have a moment each week to enjoy a pot of tea or whatever else I might feel like doing. Trivia question: Do you know what Natalie’s dog’s name is? :) This looks amazing. I like that you use mint in this too. And I’m not sure how you do this so consistently, full time job, kids and such great meals! This looks very easy and probably won’t heat up the kitchen too much. Perfect for a hot day like today! I love the simplicity of this sandwich recipe–gorgeous photos. I hear ya on rarely taking time to stop, and always being on the go. I’m definitely a perfectionist as well! That sounds and looks like a really tasty sandwich. I am constantly on the go and feel the exact same rush. I really love this sandwich. Looks very delicious, plus it is on heather side! Nicely done! Wow! Love the sandwich. Love eggplants so much. I just did an eggplant napoleon post last week. This looks exceptional and full of flavor. I can’t wait to give it a try! Glad I’m not the only one who feels on thr run .. This look so cute! We don’t eat much eggplant here – but this sandwich sounds delicious! I also always on the run and it seemed to me a lot of things will go out of control, besides can’t miss this delicious lovely eggplant sandwich, nice pictures sona. The sandwich looks so beautiful! (and simple–that is SO good this time of year!) … When I feel like I’m rushing too much, I go outside and take a few pictures of nature. That slows me down and helps remind me to breathe. Or just take a minute and watch one of our cats. Did you know just looking at a sleeping cat can lower your blood pressure? I am having these for lunch today … oooh they are SO good!